Assistant: Did you find him? Einstein: Hitler is... out of the way. 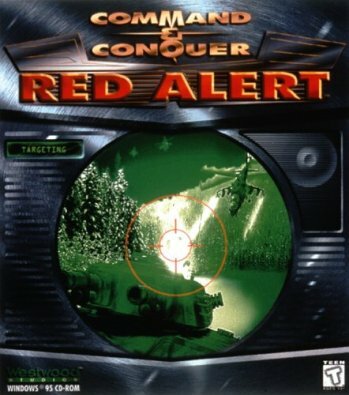 Command & Conquer: Red Alert is a spin-off of the original Command & Conquer, using the same engines and gameplay as the Command & Conquer: Tiberium saga to tell a story of time-travel, Tesla-powered communists, and parachuting bears. Plausibility can take a backseat, now. The premise is simple: in 1946, operating out of a laboratory in Trinity, New Mexico, Albert Einstein uses a time machine to travel to Landsberg, Germany in 1924 and removes Adolf Hitler from history. While this prevents the Nazis from rising to power and keeps Germany docile, unfortunately, it leaves Josef Stalin with no obstacle to the Soviet Union's expansion. This sparks an even worse version of World War Two during the 1950's as the Allies try to withstand the endless hordes of the Red Army, backed by deadly Tesla-based technology. But thanks to Einstein's chronosphere and one nameless European commander, the Soviets are defeated. Action Bomb: M.A.D. Tanks in Aftermath. All Theories Are True: The Red Alert series uses Tesla coils in ways that were once thought possible. Alternate History: Red Alert being the result of Hitler's removal from the timeline. Furthermore, the game used to be a prequel to the Command & Conquer: Tiberium series, before more time travel threw in further alternate timelines. Artistic License History: Ignoring the alternate paths that history takes and the futuristic technologies that develop in the actual games (which are just Rule of Cool), artistic license is taken with the backstory. Adolf Hitler was removed from history when Einstein traveled back in time to 1924, partly explaining the lack of opposition to Soviet expansion, but how did the Soviet Union spontaneously transform from one of the most economically underdeveloped countries in Europe into a massive superpower armed with atomic weapons ready to take over the entire continent? Also, why are all the borders in their post-1945 state? It's also stated at one point that there is a United Nations. What happened to the League of Nations? Continuity Nod: Kane features as one of Stalin's advisers. Cutscene Power to the Max: All superweapons are implied to be much more potent than their in-game usefulness (or uselessness) might suggest. Early Installment Weirdness: Red Alert 1 actually tried to play the series premise entirely straight, with subtle performances and writing. The rest of the series devolved into high Camp pretty much immediately. Empathy Doll Shot: Right at the start of the Soviet campaign, as the Soviet air force strafes fleeing villagers. You gave the orders. Heroic BSOD: Stravros suffers this as his home, Greece, falls into the vile clutches of the Soviet Union. Historical Villain Upgrade: With Hitler out of the way, Joseph Stalin causes this timeline's version of World War II. The developers were likely aiming for an exaggeration of this trope, but his actions in the story are largely consistent with what is known about him in reality. Hitler's Time Travel Exemption Act: Nice Job Breaking It, Einstein. I Am the Trope: At the end of the Red Alert 1 Soviet campaign, we get this exchange (they're talking to the player character). Nadia: "Fight our battles where you must, and you will remain our loyal, and obedient servant. For the foreseeable future." Kane: "The foreseeable future...? Comrade chairman, I am the future." Karmic Death: Delivered nicely in the Allied ending onto Joseph Stalin by none other than Stravros, whose country Stalin destroyed in the war. Kick the Dog: The briefing of the first Soviet mission opens with Stalin and two other Soviet leaders discussing the testing of a new nerve gas on a few hundred innocent civilians before turning to you. Then you are assigned your first mission: killing the inhabitants of Torún, Poland by strafing them with fighter planes. Kill'Em All: The Soviet campaign ends like this, with everyone you meet dying in a convoluted series of back stabs and paranoia. Well, everyone except the adviser that is. Klingon Promotion: Nadia poisons Stalin at the end of the Soviet campaign. Her promotion doesn't last long. Let No Crisis Go to Waste: In the Soviet victory scenario in the first game, the entire Russian war effort was a huge Xanatos Gambit by Kane to expand the USSR, then topple it, and use the ensuing chaos to strengthen the Brotherhood of Nod. Meaningful Echo: Stalin comments on how excellent the tea is, and Nadia comments that she made it herself. She said the exact same thing when she killed Marshal Gradenko. Both cups were poisoned. A Million Is a Statistic: Stalin (to whom the phrase is commonly credited, apocryphally) throws this line out there in the first Red Alert. It can also be heard in the remixed "Radio 2" song which is included in the CD of Counterstrike and Aftermath. Name of Cain: The first Red Alert game is where it's first implied that Kane is actually the Biblical Cain. Nadia: "And Cain went out from the presence of the Lord...and took up residence... in the Land of Nod!" Nuke'Em: Employed by the Soviets in the Allied campaign. As the Allies turn the tide of the war and are steadily advancing across Europe into the Soviet Union, Stalin decides to destroy the primary capitals and cities of the European Allies with the nuclear weapons his scientists have recently developed, while using his own forces as a sacrificial lamb to draw attention away from the missile sites. The player has to capture and then infiltrate the facility to safely dismantle the weapons. Piggybacking on Hitler: Kane is doing this with Stalin. Schizo-Tech: The technology is all over the place, with assault rifles from '49, helicopters from '72, and GPS mounted on Sputnik-like satellites. On a general scale, the tech level is that of 'Nam. Shown Their Work: Chillingly so, from how the Allies would function in such a war (heavily dominated by European forces rather than US), to the nature of the Soviet Union and Stalin himself. Sliding Scale of Silliness Versus Seriousness: Compared to its two sequels in the series, this game retains the most serious tongue. Tampering with Food and Drink: At the end of the Soviet campaign, Nadia successfully kills Joseph Stalin by tricking him into drinking a poisoned cup of tea. You Have Failed Me...: Stalin warns the player "If you fail, do not return", and later snaps an underling's neck for faulty intelligence ("You disappoint me, Kukov"). This was just after he ordered you executed. Zerg Rush: A popular tactic among Soviet players is to build nothing but a massive force of heavy tanks and overwhelm their opponent. Black-Out de base and nothing will stop you. ↑ The aggressive Take Over the World plan is in itself already ignoring Stalin's cautious nature and "Socialism in one country" policy.